Montville & Malany: unique shopping, quaint cafes/restaurants, spectacular country, with breathtaking views. The Sunshine Coast includes up to the Cooloola area which is the gateway to Fraser Island. 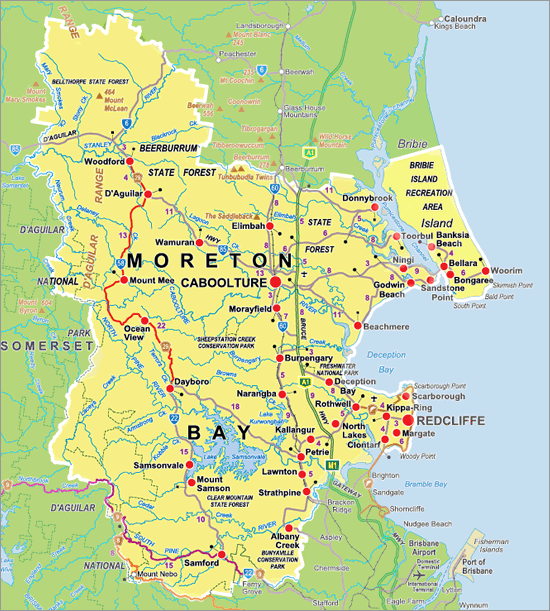 In between this, there is Kawana, Mooloolaba, Maroochydore, Coolum Beach, Noosa and Rainbow Beach. The Sunshine Coast Hinterland is easily accessible and has an elevation of 450m which has amazing views to the ocean. The area is lush farming land and boosts fascinating little towns, art galleries, country markets and excellent restaurants. Take in the Glass House Mountains, Blackall Range, Noosa Hinterland and the Mary Valley.